For many years now, the most popular poet in America has been a 13th-century mystical Muslim scholar. Translations of Mawlana Jalaluddin Rumi's - better known as Rumi - verse are hugely popular and have been used by Western pop stars such as Madonna. They are attracted by his tributes to the power of love and his belief in the spiritual use of music and dancing - although scholars stress that he was talking about spiritual love between people and God, not earthly love. Rumi, whose 800th birth anniversary falls on Sunday, was born in 1207 in Balkh in Central Asia, now part of Afghanistan. I came here to see whether he has much resonance in his native country which, under the Taleban, went so far as to ban music. 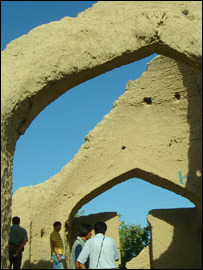 A young Afghan archaeologist, Reza Hosseini, took me to the ruins of the mud-and-brick-built khanaqa - a kind of madrassa or religious school - where Rumi's father taught and the young boy is believed to have studied, lying just outside the old mud city walls and probably within yards of his birthplace. It is a quiet and melancholy place, the structure eroded and encroached on by shrubs and bushes. But an amazing amount of it is still standing - the square structure, its four arches with pointed tops, in the Islamic style, and half of the graceful dome. Mr Hosseini says the floor was originally constructed of baked bricks and lined with carpets donated by those who came to share the learning. Sufism - or Islamic mysticism - was already enshrined here before Rumi's time and Mr Hosseini imagines that this corner of the town, by the madrassa, would have echoed to the sound of Sufi singing and prayer. But, he says, it is unclear how widespread, or acceptable, practices such as music and dance were in the wider population. When Rumi was barely out of his teens, Balkh was reduced to rubble by Genghis Khan's marauding Mongol invaders. 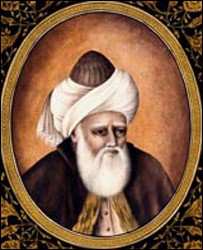 Rumi had fled in advance with his family and settled in Konya, now in Turkey. After the murder of his close friend, a Persian wandering dervish called Shams-i-Tabriz, he was depressed for years but later wrote his greatest poetic work, the Mathnawi. It describes the soul's separation from God and the mutual yearning to reunite. With his injunctions of tolerance and love, he has universal appeal, says Abdul Qadir Misbah, a culture specialist in the Balkh provincial government. "Whether a person is from East or West, he can feel the roar of Rumi," he says. "When a religious scholar reads the Mathnawi, he interprets it religiously. And when sociologists study it, they say how powerful a sociologist Rumi was. When people in the West study it, they see that it's full of emotions of humanity." The Sufi mystical tradition is not immediately apparent in modern Afghanistan. But with Mr Hosseini's help, I traced a small group of eight Sufi musicians in the city of Mazar-e-Sharif whose great love is Rumi's poetry. First there is a solo from Rumi's favoured instrument, the reed flute. 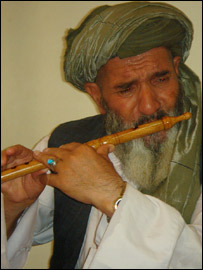 Then the flute player is joined by Mohammed Zakir, usually a shopkeeper, who fills the room with his powerful voice in interpreting the words "I'm a man who's not afraid of love; I'm a moth who's not afraid of burning". In the third song, all the men join in with an extraordinary, percussive vocal sound which, Mr Zakir says, comes straight from the heart. It continues for nearly 10 intense minutes. I meet Professor Abdulah Rohen, a local expert on the poet, who says that, regrettably, knowledge of Rumi - also known as Mawlana - has declined recently. "Forty years ago the economic situation of the people was good. People would work in the summer time collecting food and would eat it in winter. In winter they were free. They would gather in mosques and sing Mawlana's poems. "But in the past 10 or 15 years people's economic situation has deteriorated, so they are far from Mawlana." 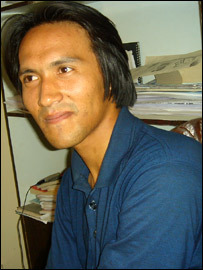 He says the advent of communism in Afghanistan brought poetry into disfavour because it was seen as backward-looking. Then the Taleban attempted to crush Sufism and outlawed all music, but Prof Rohen says it has since regained huge popularity. According to him, Rumi brought Sufi mysticism away from asceticism and into the heart of the people. Many western fans of Rumi have secularised his message. It was in fact a religious one; and, says Prof Rohen, Christians and Jews as well as Muslims flocked to his funeral. I ask him to sum up the poet's message and he offers a quote. "Mawlana says - if the sky is not in love, then it will not be so clear. If the sun is not in love, then it will not be giving any light. If the river is not in love, then it will be in silence, it will not be moving. If the mountains, the earth are not in love, then there will be nothing growing."